Please scroll down to view sample prices. This Arts & Crafts style bathroom vanity is made from solid white oak. 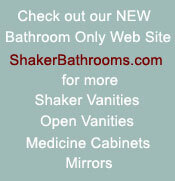 We also offer the same vanity in solid Poplar in your choice of 56 colors. All finishes are protected by six coats of wiped on satin polyurethane. Shown with a false front drawer. The price includes hardware but not the sink, faucet, towel bar, or backsplash. Height and Depth: Standard heights now range from 32" to 36" and depths range from 21" to 22 1/2" but if you need a different height and/or a different depth -- No problem and NO charge! Just let us know what you need; we will even design around your current plumbing for FREE. Your Top or Ours: We'll cut our solid wood top to fit your sink(s) or you can have your top locally made and installed. Our sturdy vanities will hold the heaviest stone tops made. NOTE: Sample prices shown below are full price. However, only 50% is due at time of order with the balance plus shipping due when your item is ready to ship. Or if you prefer, call us at 603-860-9377 and speak to the craftsman that will build your new vanity.